Firm: Michael J. Redenburg, Esq. P.C. In over a decade of legal practice, Attorney Michael Redenburg began his career defending cases for the clients of insurance companies. Initially defending no-fault claims at a Long Island based law firm, he then moved on to a Manhattan based firm where he defended the clients of insurance carriers in auto accident and premises liability matters. It was there that Attorney Redenburg tried his first case, defending the firm’s insurance company’s insured and successfully obtaining a directed verdict on behalf of his client. Subsequently, Michael J. Redenburg, Esq., defended clients facing various criminal charges throughout the five boroughs, successfully trying cases to verdict in Brooklyn, Manhattan, Staten Island and the Bronx, honing his trial skills. Michael Redenburg has handled hundreds of auto accident cases throughout the five boroughs; Suffolk County, Nassau County and Westchester, recovering hundreds of thousands of dollars for his clients injured due to the negligence of others. He has also tried numerous civil cases to verdict in the State and Federal Courthouses located in both Brooklyn and Manhattan. Along with co-counsel, Michael Redenburg successfully represented a class of NY Kmart loss prevention managers who claimed that they had been misclassified as exempt and denied overtime pay. A five hundred thousand ( $500,000.00 ) dollar settlement resulted. Additionally, Michael Redenburg has represented victims of wrongful arrest, stop and frisk and false arrest in lawsuits against The City of New York in federal court, and has successfully represented hundreds of citizens who have been victimized by the NYPD in wrongful arrest & stop and frisk lawsuits. His efforts have led to his clients collectively recovering hundreds of thousands of dollars in compensation. 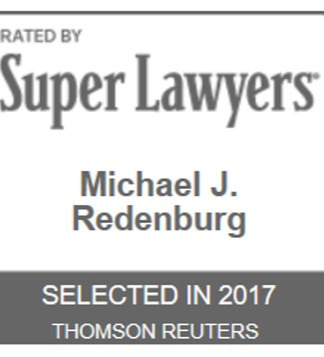 In 2014 through 2017 Michael Redenburg was named a SuperLawyer, NY Metro Rising Star by Thomson Reuters and no more than 2.5% of lawyers in a state are given this rating. Attorney Redenburg was also named a Top 40 Under 40 attorney by American Society of Legal Advocates (“ASLA”) in 2014 and 2015 and ASLA limits its membership to less than 1.5% of all licensed lawyers nationwide. Additionally, in 2014 and 2015 Attorney Redenburg was named Top 40 Under 40 by The National Trial Lawyers, which is invitation only, based on nomination and peer reviewed.